A qualifications body has amended its policy on shorthand after a row involving a disabled journalism student. 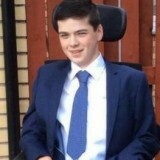 The Scottish Qualification Authority is now set to offer two separate qualifications in journalism after previously telling Glasgow Clyde College student Kyle Gunn, left, he will not receive higher national diploma in practical journalism because he is unable to complete the shorthand section of the course due to his disability. The SQA has now reviewed its policy after Kyle’s case was reported widely earlier this week. The body will now offer two qualifications at HNC and HND level – practical journalism (with shorthand) and practical journalism (without shorthand). The SQA says the move, which comes into effect from spring 2018, will allow students to decide whether shorthand is relevant to the particular form of journalism that they intend to pursue. An SQA statement reads: “Arrangements will be made for learners for whom shorthand is not appropriate and who are already studying for the existing Practical Journalism HNC and HND to be transferred to this new framework. “This means that learners who are due to start HNC and HND SQA qualifications in Practical Journalism in the session 2017-18 can complete their awards without shorthand if they wish. “We will write to delivery centres to advise them of these changes. In particular, we have contacted Glasgow Clyde College, where learner Kyle Gunn is enrolled on the Practical Journalism HNC/D to inform the college. Let’s face it, you don’t need much shorthand for cut and paste.